Oilfield Drilling Crew Salaries (Roughneck, Floorhand, Driller etc). As many of you are aware, This NatResPro Community is an offshoot of the main website and service offerings. We offer oil companies and recruiters tools such as a vetted candidate database, well design consulting and rig data. Our manpower services are geared towards the job title of drilling engineer (or equivalent) and higher. The reason for this is that many drilling rig companies have their own rig crews. Other companies hire local staff. For entry-level jobs or roles that are not specific to the oil and gas business, it's a lot of work dealing with the sheer volume and demands of the global market. This is why you don't see us offering to fill electrician or crane operator roles. That said, we get enquiries and questions about entry level oil field jobs, as well as the ones that can be transferred into from a similar role. Some engineering or physical jobs can be quickly picked up with no previous oilfield experience. The oil price crash of 2014-17 meant that hundreds of thousands were forced to leave the industry. Rig crews were disbanded and workers entered different industries. Now, the cyclical upturn has been filtering through around the world in 2018, as well as the usual skills shortage in some areas. Heres an article from the past few days that suggests that many oil wells will sit idle in 2019 due to a lack of oilfield workers. This seems crazy considering the rapid expansion in the onshore US lower 48 states these past few years. It seems that the industry will never learn lessons about boom-bust downsides, and leaders seem to prefer the rollercoaster. This page can serve as a reference for all of the main rig crew salary updates. As the numbers change, we can update with new posts, or edits to the old posts. To get the ball rolling, we can start with some of the most common, oil industry-specific jobs. I've done some research at the Bureau of Labor Staistics in the USA, and at the National Careers Service, which is a government-run website in the UK. You can go to these websites to double check current numbers, job descriptions and other similar helpful advice. Realise that any of the job salaries mentioned will be an average. Individual take-home pay will vary between companies, the level of experience and location. Also, bear in mind that offshore and international positions always pay a lot more as well. Before we go into brief descriptions of some of the main manual oilfield positions, and the recent salaries, here are a few words from an expert. Lenin Diaz has been a cementing expert for over twenty years so works with rig crews all the time. Entry level oil field jobs are very attractive to young and physically strong people. Most young people when leaving high school have tough choices. Do they stay in education, get into student loan debt, and wait for a long time to break even? Or do they get to work right away, and face the possibility of hitting a job ceiling? The oil and gas industry is a special place for many reasons, but one is that anyone can work their way up the ladder based on hard work and experience. A floorhand can even end up as a project manager or CEO one day. Because every rig site has a combination of people from more than a dozen different companies, we get fewer politics and more merit-based promotion. I've given advice regarding cementing engineering training here, some of which applies to entry-level positions. If you want to find out more about what Lenin does, go over to his 'Better Cementing For All' website, which has dozens of posts on many different O+G topics. The person in charge of this team is a toolpusher, but most of the physical work is done by the Roughnecks. 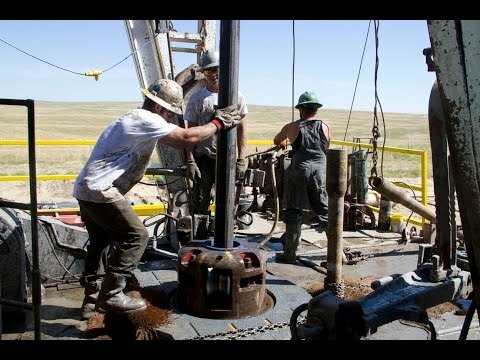 An onshore roughneck in the USA will make $20-30 per hour. Annual salaries vary because there tends to be a lot of opportunity for overtime and bonuses. If we look at a 40 hour week, this comes to $41,600+ per year if it's an employed position and the sick and vacation days are included. It's easy to find details on the salary of a Roustabout, it seems that both the BLS and the National Career Service have a preference for listing this category. The figures vary tremendously on both websites. The NCS give a range of £18,000 to £30,000 average per year. This is obviously based on experience, but 30k is well above the national average for all full-time workers. The range here is even bigger than in the USA $12.78-28.39 per hour, and $26,580-$59,050 annually. It's clear that the average salary for a roughneck and a roustabout is similar, and more dependent on experience. Floorhands include chainhands, who throws the chain to help spin up the connections of the drill string. Nowadays this is often automated. Another variation is a leadhand which is also affectionately called a 'worm' because its the lowest rig job. That said, maybe derogatory terms like that are being phased out with anti-bullying initiatives. The leadhand will do any job that is asked, including the ones that no ones else wants to do, including operating the tongs, iron roughneck, and making the coffee. Floorhand salaries vary between $18-28 per hour, (£14-22). Due to the low-level nature, and lack of experience needed, there are a lot of trainees and people fresh to the industry. Because of this, the average is close to $18, not $28. Note: floorhands, chainhands and leadhands are not to be confused with everyone that gets called 'hand' by the old timers! The derrick-hand is also called the derrickman, this is the same thing. The derrick-hand looks after the drilling mud, mud pits, and the mud pumps. They are also 'the hand' up in the derrick manipulating stands in and out of the fingers during tripping operations. They Act as lead for the driller who gets restricted to the rig floor. Derrick-hand is a more skilled position and salaries start at $24 (£19) per hour up to around $40 (£31). Annual pay is in the region of $60-80,000 (£47-63,000) per year.